Description: Second of the Seven Days Battles*. Gen. Robert E. Lee initiated his offensive against McClellan’s right flank north of the Chickahominy River. 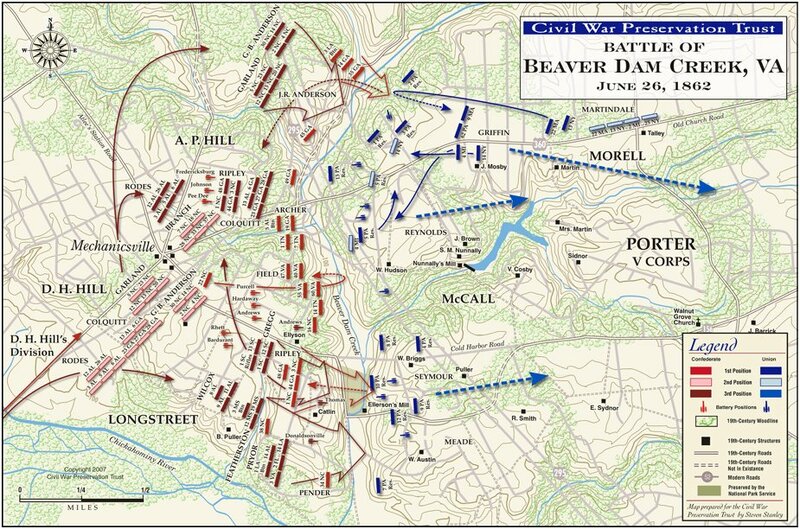 A. P. Hill threw his division, reinforced by one of D. H. Hill’s brigades, into a series of futile assaults against Brig. Gen. Fitz John Porter’s V Corps, which was drawn up behind Beaver Dam Creek. *The second phase of the Peninsula Campaign, consequently, took a negative turn for the Union when Lee launched fierce counterattacks just east of Richmond in the Seven Days Battles (June 25 – July 1, 1862). 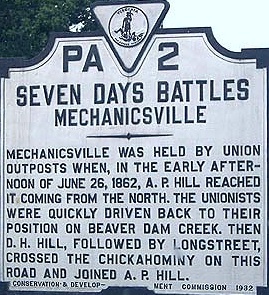 Although they are formally considered part of the Peninsula Campaign, the final battles of June 25 to July 1, with Lee in command and on the offensive against McClellan, are popularly known as the Seven Days Battles. This book offers nine essays in which well-known Civil War historians explore questions regarding high command, strategy and tactics, the effects of the fighting upon politics and society both North and South, and the ways in which emancipation figured in the campaign. The authors have consulted previously untapped manuscript sources and reinterpreted more familiar evidence, sometimes focusing closely on the fighting around Richmond and sometimes looking more broadly at the background and consequences of the campaign. From the Inside Flap: The Richmond campaign of April-July 1862 ranks as one of the most important military operations of the first years of the American Civil War. These nine original essays, by well-known Civil War historians, explore questions regarding high command, strategy and tactics, the effects of the fighting upon politics and society both North and South, and the ways in which emancipation figured in the campaign. Contributors: William A. Blair, Keith S. Bohannon, Peter S. Carmichael, Gary W. Gallagher, John T. Hubbell, R. E. L. Krick, Robert K. Krick, James Marten, and William J. Miller. About the Author: Gary W. Gallagher is John L. Nau III Professor of History at the University of Virginia. He has published widely on the Civil War, including six previous titles in the Military Campaigns of the Civil War series. Publishers Weekly: Sears complements his 1988 biography of George McClellan with this definitive analysis of the general's principal campaign. McClellan's grand plan was to land an army at Yorktown, move up the Virginia peninsula toward Richmond, and fight a decisive battle somewhere near the Confederate capital, thereby ending the Civil War while it was still a rebellion instead of a revolution. The strategy failed in part because of McClellan's persistent exaggerations of Confederate strength, but also because under his command the Federals fought piecemeal. The Confederates were only marginally more successful at concentrating their forces, but Sears credits their leaders, especially Lee, as better able to learn from experience. Confederate victory on the Peninsula meant the Civil War would continue. The campaign's heavy casualties indicated the kind of war it would be. About the Author: Stephen W. Sears is the author of six award-winning books on the Civil War. He lives in Connecticut. Schroeder analyzes this crucial campaign from its genesis to its lasting consequences on both sides. Featuring a detailed bibliography and a glossary of terms, this work contains the most complete Order of Battle of the Peninsula Campaign ever compiled, and it also includes the identification of commanders down to the regiment level. In addition, this groundbreaking volume includes several highly-detailed maps that trace the Peninsula Campaign and recreate this pivotal moment in the Civil War. Impeccably detailed and masterfully told, Seven Days Before Richmond is an essential addition to Civil War scholarship. Schroeder artfully enables us to glimpse the innermost thoughts and motivations of the combatants and makes history truly come alive. The political and strategic aspects of the campaign are given fair due, but the emphasis is on the human element. The central incidents on which the personal narratives hang include the Monitor-Merrimack battle, "Stonewall" Jackson's diversionary maneuvers in the Shenandoah Valley and Lee's daring counteroffensive in the Seven Days Battles. The book is rich in dramatic anecdote, telling detail and eloquence. But the maps are where this book really stands out. Each battle features a very clear map designating army positions and historical roads, as well as historical markers (the author also wrote the /A Guidebook to Virginia's Historical Markers/), parking, and visitors' centers. Best of all, though, many battles are illustrated with paintings or photographs of the sites, and the point-of-view of these pictures is marked on each map!